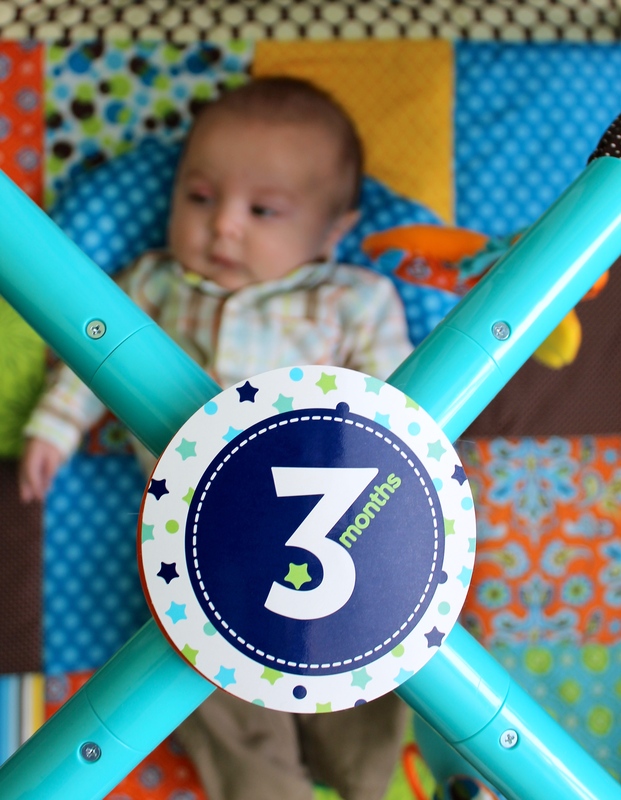 I can not believe that our little rockstar has been here for 3 months! This has been a great month for him. ** We have an appointment with a NICU graduation clinic next week. 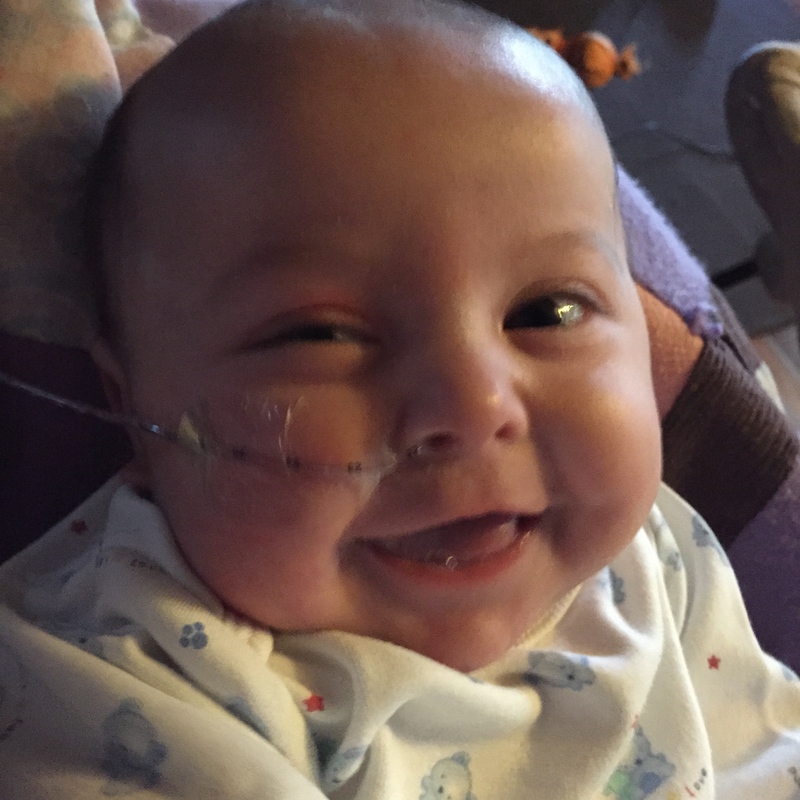 It’s a service connected to his NICU where they monitor premature infants through their first years of life. So after that I will post another update about how he is doing. 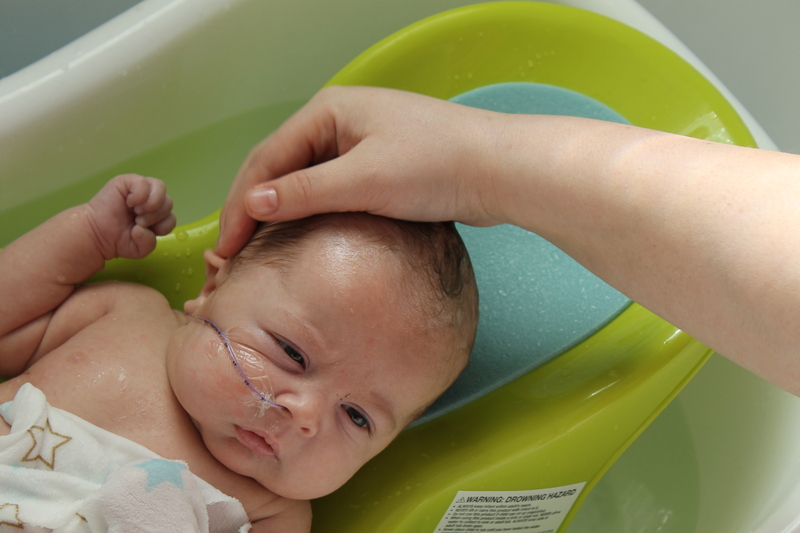 Our biggest achievement this month is that our boy no longer needs his NG feeding tube. After a week of consistently taking his total volume by mouth, and exceeding his goal— It’s official! 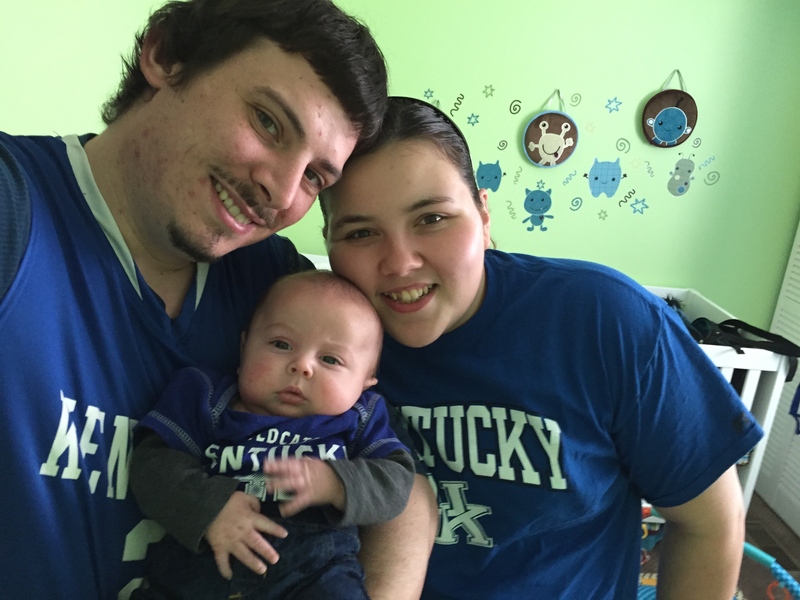 Finally NG free, and getting ready to go to grandma’s house to watch the UK Basketball team (#1 in the nation!) play. As of yesterday we learned that we can feed him on demand. Previously we had been keeping him to a 3 hour schedule so he could really master eating. 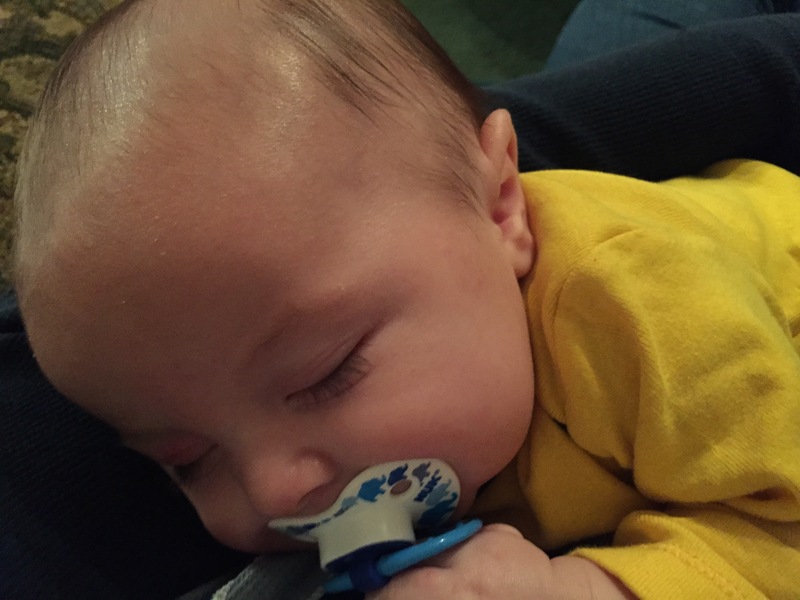 It was hard because during the day when he’s awake and alert he’s hungry about every 2 hours— You try keeping a hungry baby at bay for an hour! Then at night I would have to wake him up every 3 hours to eat because he sleeps so well. 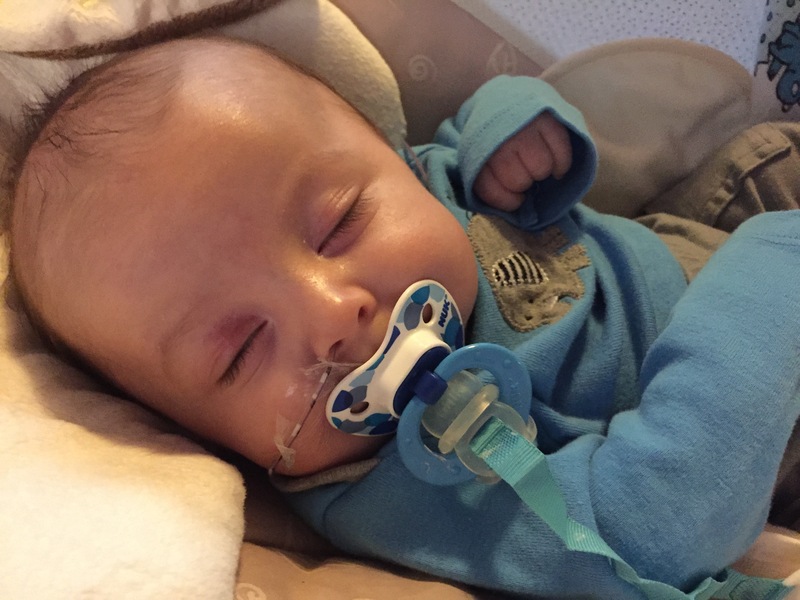 Now his pediatric surgeon is comfortable with us feeding him on command, so that means we can feed him more during the day and let him ‘sleep through the night’— We haven’t really had a chance to try this just yet— but I was excited to get the news! This month was also huge in terms of his development. He’s so much more alert and interactive. He has officially masted the social smile. He loves to have his cheeks lightly tickled while you make eye contact and talk with him; he lights up every single time. He also has started to notice his toys. I lay him on his play mat and he looks at the animals and loves when I make them jingle. I also have a toy that goes across his car seat handle and it’s been great for the long car rides. Before now he really only focused on lights. He still loves to look at lights, but I’m loving how much more he’s getting interested in other things. Look at that baby smile! 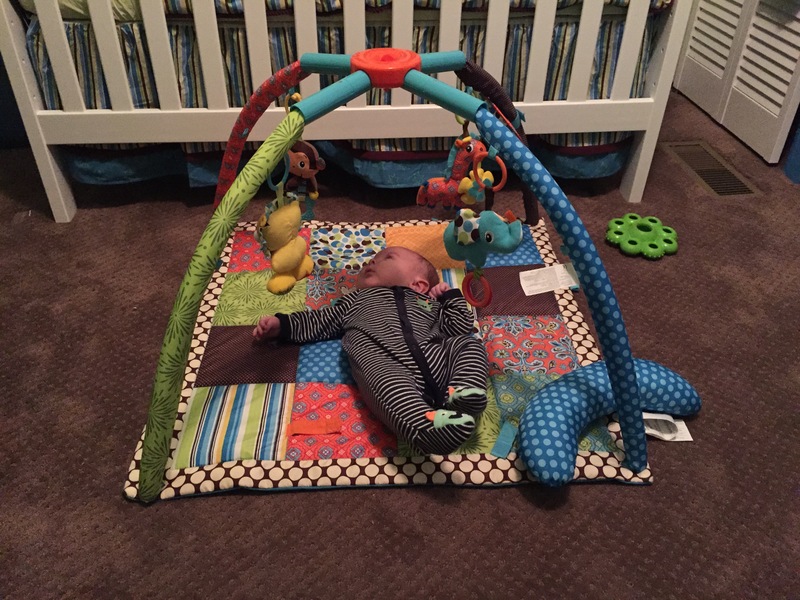 Hanging out on his play mat. He loves it. He has also really strengthened his neck muscles and nearly has full control of his head. He loves to look around, and isn’t always content just being snuggled close to us. It’s so sad that he’s already starting to outgrow that, but I love seeing him enjoy his surroundings. He finally got a real bath, and he loves relaxing in the water and looking around. He still loves to be swaddled, and we just went up to the large size in the summerinfant swaddleme. His others still fit, but it was a snug fit. He’s got plenty of room to grow in his new ones. He still hates having his diaper changed, and being dressed after a bath. We’re still sleeping in the Rock n’ Play because he needs the incline, but if he starts doing better sleeping through the night we might be making the transition to his crib soon. **With a device that will also keep him inclined. *A little blurry. Hanging out in his rock n play. 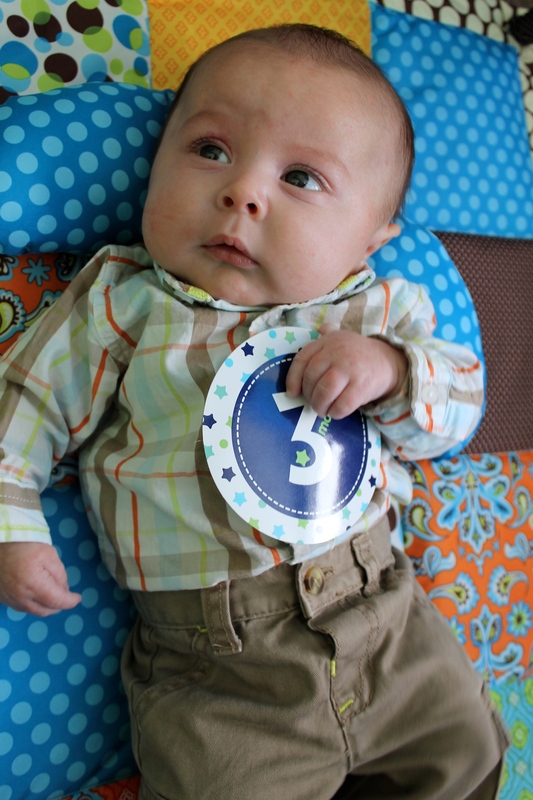 He is still in 0-3 and 3 month clothes. His carters brand sleeper outfits are starting to get tight in the length, but we’ve still got some time before I need to upgrade him to 6 month. — However, as soon as he’s ready he has So. Many. Clothes. in the next size up. I got a little panicked because he was starting to outgrow his clothes and we didn’t have much in the next size… So I may have went a little crazy shopping. Crazy as in… I just about purchased every single thing Target had in 6 months that was seasonally appropriate. On top of that we received a very large tote of his cousin’s old clothes. So! He tipped the scales at 11 pounds 5 ounces, and is 21.5” long. Up 5 pounds 14 ounces, and 2.75” from birth. I love taking pictures when he’s sleeping. I’m with the baby between 8pm-4am, and then my husband stays with the baby from 4am-noon (although I usually get up around 10am.) He’s been eating at 2-5-8-11. Our day ‘starts’ with the 11am bottle. I’ll change his diaper, dress him for the day, and feed him. Then we have about a solid 3 hours of good alert time. After his 2 o’clock bottle he usually naps for an hour or 2. He wakes up, eats, and has another period of alert time. Before his 8pm bottle I’ll dress him in his pajamas, and we’ll eat, be swaddled, dim the lights, and our nighttime routine begins. He sleeps pretty much through the night except when he’s up to eat, but around 5am he has another period of alert time until his 8am bottle and then he’ll sleep. 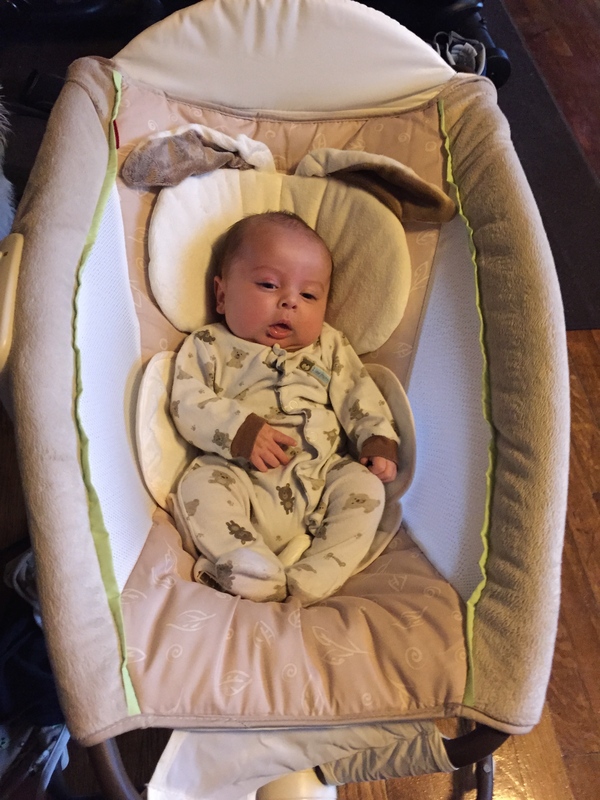 We started using the sound machine and it has really improved his sleep! I’m able to clean up the kitchen after I lay him down around 8 without him waking up, and his sleep is deeper and more peaceful. Before he seemed to sleep very lightly and was easily disturbed. So thank goodness for the sound machine. I know I am forgetting things, but this is the bulk of how the last month has been. I’m excited to see what this next month will bring. Each month it gets better and better.